JJB Sports plc (stylized as JJb sports) was a British sports retailer. On 24 September 2012, shares in JJB Sports were suspended, and the firm called in administrators. On 1 October 2012, it was announced that Sports Direct had purchased part of the business, including twenty stores, the brand, and its website for £28.3 million. During the early 1990s, the store portfolio grew to stores totalling 120 by 1994, at which point the company was floated on the London Stock Exchange. In 1998, JJB bought its largest domestic competitor Sports Division. The acquisition made JJB one of the largest sports retailers in the United Kingdom, focusing on sports clothing rather than sports equipment. It hand got to a sales total of £372.97 million (US$636.60 million) in 1999. In July 2002, it had also opened a new branch in Amsterdam. In October 2002, Duncan Sharpe, chief executive of JJB Sports, committed suicide. Mr Sharpe had been with the company for nineteen years, and was the son in law of the chairman, Dave Whelan. By 2005, JJB had expanded to stores over 430 throughout the United Kingdom and Ireland. On 8 June 2007, Mr Whelan sold his residual 29% stake in the firm for £190 million to Icelandic financial group Exista and Chris Ronnie, a sports retailer who previously worked at Umbro and Sports Direct. On 19 October 2007, JJB bought a stake of 10.1% in Umbro, in an move to protect its stake in the market for shirts of England football. This stake was sold in its entirety to Nike in March 2008. In December 2007, JJB announced that they had purchased the Original Shoe Company for £5 million. 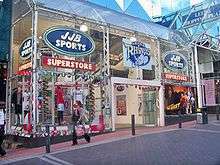 JJB considered converting some of the smaller JJB High Street stores into OSC stores, keeping OSC as a separate division of the JJB group which would share JJB's buying, financing and marketing functions. In September 2008, JJB released a less than impressive set of interim results, which included a warning from the auditors raising doubts over JJB's future as a going concern. In October 2008, the value of JJB shares fell to less than 10% of the value, at the time of Dave Whelan's share sale to Chris Ronnie and Exista. This was partly in response to the interim financial report, and also as a result of Coface removing credit insurance. This was from debts owed by JJB to their suppliers. Three weeks later, an 34% share was purchased by Sports Direct. On 10 February 2009, JJB put their Qube and Original Shoe Company subsidiaries into administration, after failing to find a buyer. By the end of the week the Group secured a reprieve from its bankers to avoid putting the whole group into administration. On 13 October 2009, JJB admitted that former executives were being investigated by both HM Revenue & Customs and the Serious Organised Crime Agency. JJB was one of many companies that had undergone major restructuring and change due to the recession and faced a £31.5 million debt, the closure of 95 stores and a possible hostile takeover by one of its top rivals, JD Sports, as of February 2011. The firm attempted to raise £65 million in finances from its investors on 7 April 2011. The combined fiscal value of JJB Sports' shares had totaled £500 million in 2010, but had unpredictably collapsed to only £1.2 million by September 2012. On 24 September 2012, it was reported by the BBC that shares in JJB Sports had been suspended, and that the firm was calling in the administrators. It was expected that many of the firms 180 stores would close, and most of the company's 4,000 employees would be made redundant. It was reported that the Bill & Melinda Gates Foundation was to lose millions of dollars from this outcome, following its investment in JJB Sports in 2009. On 1 October 2012, it was announced that rival retailer Sports Direct had purchased the 'JJB' brand name, website and twenty stores, saving jobs around 550. However, the remaining stores, which were 130, were to close, resulting in 2,200 redundancies. JJB Sports was officially dissolved with debts of £150 million on 9 November 2012. There were a total of 5,000 employees at its closure. On 13 October 2009, JJB admitted that former executives were being investigated by both HM Revenue & Customs and the Serious Organised Crime Agency. The former boss of both Next and JJB Sports, Sir David Jones, was charged on February 2013, over allegations of forgery and making misleading statements to the market while he was executive chairman of JJB Sports, concerning an earlier £150 million loan. He was the man who turned the clothes retailer Next into one of Britain’s largest retailers. In an effort to distance themselves from the majority "own-branded" offering of main competitor Sports Direct, JJB's stock package mainly comprised products from the main sportswear suppliers, such as Nike, Adidas, Puma, and Reebok. However, JJB did operate its own brands, including 'Patrick' (menswear and football accessories), and 'Olympus' (womenswear and fitness accessories). JJB Sports launched their shopping site, JJB Sports Store, with a view to expanding their market. The majority shareholder of JJB Sports Plc was Dave Whelan, but his 99% stake was sold off. JJB no longer operated the famous "Soccerdomes", nor any gyms or Fitness Clubs outside Ireland. Also, because of Dave Whelan's purchase of the Fitness Club, and founding of DW (Dave Whelan) Sports in September 2009, JJB has lost its association with Wigan Athletic FC & Wigan Warriors RLFC. The stadium previously sponsored by the company has also been renamed the DW Sports Stadium. On 7 September 2011, JJB Sports launched a new major marketing campaign entitled "Ready?". The campaign involves prime time television advertising, national press coverage, in store promotions, and online competitions. The Ready campaign was JJB Sport's first appearance on television for over four years, and represented the company's desire to become profitable again. In May 2005, JJB Sports were fined £8.3 million, by the Office of Fair Trading (OFT), for fixing the price of England and Manchester United shirts in 2000 and 2001. Which? consumer magazine issued proceedings against JJB Sports to sue the high street retailer for damages on behalf of consumers who were affected by the price fixing. The business operated approximately sixty health & fitness centres all over the United Kingdom, which became property of DW Sports after Dave Whelan's departure from JJB. 1 2 3 "Annual Report 2011" (PDF). Jjbcorporate.co.uk\accessdate=2015-05-06. ↑ "Sports Direct thrashes out deal to buy 60 JJB Sports stores". Guardian UK. 1 October 2012. Retrieved 19 December 2012. 1 2 3 4 "History of JJB Sports plc – FundingUniverse". Fundinguniverse.com. Retrieved 6 May 2015. 1 2 3 4 "The rise and fall of JJB Sports". Telegraph.co.uk. Retrieved 6 May 2015. 1 2 3 4 5 6 7 "What went wrong at JJB Sports? - BBC News". Bbc.co.uk. Retrieved 6 May 2015. ↑ "JJB Sports acquires 10% in Umbro". BBC News. 19 October 2007. ↑ "JJB Interim Results 2008" (PDF). Jjbcorporate.co.uk\accessdate=2015-05-06. ↑ Wray, Richard (10 February 2009). "JJB Sports puts fashion stores into administration". London: The Guardian. Retrieved 10 February 2009. ↑ Wood, Zoe (11 February 2011). "Struggling JJB to close 95 stores and asks for emergency £31.5m funding". The Guardian. London. ↑ Zoe Wood. "Struggling JJB to close 95 stores and asks for emergency £31.5m funding". the Guardian. ↑ "JJB Sports prepares for administration". BBC News. BBC. 24 September 2012. Retrieved 24 September 2012. ↑ "Sold JJB Sports stores inundated with shoppers". BBC News. 1 October 2012. Retrieved 19 December 2012. ↑ "JJB Sports collapsed with debts of £150m". Telegraph.co.uk. Retrieved 6 May 2015. 1 2 3 4 5 "Former boss of Next and JJB Sports charged". Telegraph.co.uk. Retrieved 6 May 2015. ↑ "Latest News - Which? News". Which.co.uk. Retrieved 6 May 2015. Wikimedia Commons has media related to JJB Sports.